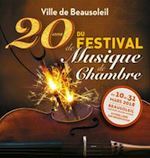 From 10 to 31 March, Beausoleil's Service Culturel is organizing its annual Festival de Musique de Chambre. Concerts take place on Saturday evenings in the Theatre Michel Daner, just a short walk uphill from the centre of Monaco. Concerts are free, however seats are limited and so reservation is advised. If you reserve, you must take your seat 5 minutes before the performance begins, otherwise the places will be re-allocated. For more information about the Festival de Musique de Chambre, and to reserve a seat, phone +33 04 93 78 90 80 or email culturel[at]villedebeausoleil.fr. For a full program, visit the organizer's website at: Beausoleil Town.